I was provided an electronic copy of this book in exchange for my honest review. Sarah and Jon (twins, with Jon just a couple minutes older) were expecting a boring summer visiting their grandparents in Wales. But after hitting a large creature with the car, and passing the same TwoSpells sign multiple times while feeling like they’re lost, everything starts to seem a bit out of the ordinary. Upon arrival at their grandparents’ home, their mother disappears on a mysterious errand, and the twins are left to do their grandparents bidding around the farm. In the evening, though, they’re delighted to listen to stories of their supposedly magical heritage, things they’d never known about, since they were raised far away as ‘Regular’ non-magical people. The story really gets moving when they finally visit the legendary TwoSpells library with their grandparents. There is indeed a magical battle, as their grandparents told them about. The library is the middle of a family battle in which the twins are critical players, even though they never knew til days before. They suddenly have to learn how to use their magical library cards to travel in and out of stories, as well as how to fight creatures they’ve never seen or heard of before. Luckily they have the help of manufactured Golems, a couple of library Guardians, and even their mother as a magical being they’ve never witnessed. TwoSpells, the first book by author Mark Morrison, is a great mystical read of a classic good vs evil struggle. There’s so much more to find out in books still to come! 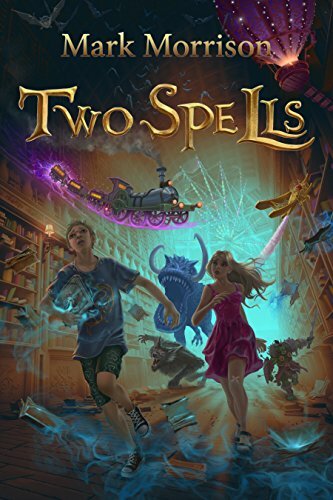 I’d give this book 3.5 out of 5 stars, and recommend it for middle-grade readers who enjoy fantasy. Sounds like a perfect read for young readers. Heck I might even enjoy it! Sounds like a good read for middle school/younger high school people :) I love sci-fi and fantasy books. Sounds like a great book for middle school and high schoolers. Thanks for the review!